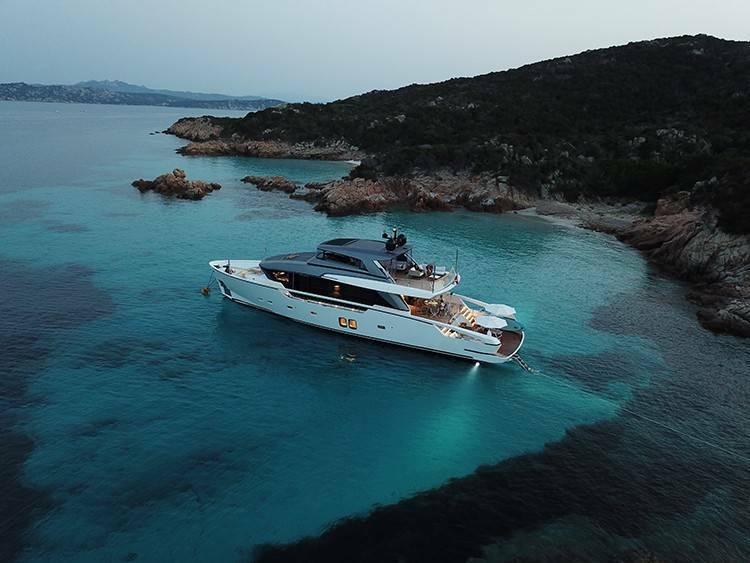 OZONE is a 26.70m (87' 7") displacement motor yacht launched by Sanlorenzo in 2018, featuring accommodation for up to nine guests in for cabins. There is a crew of three offering exceptional service during the entire charter vacation. The lower deck swim platform is a spacious environment for sunbathing or sitting and enjoying the view beneath two large sun umbrellas available on request. 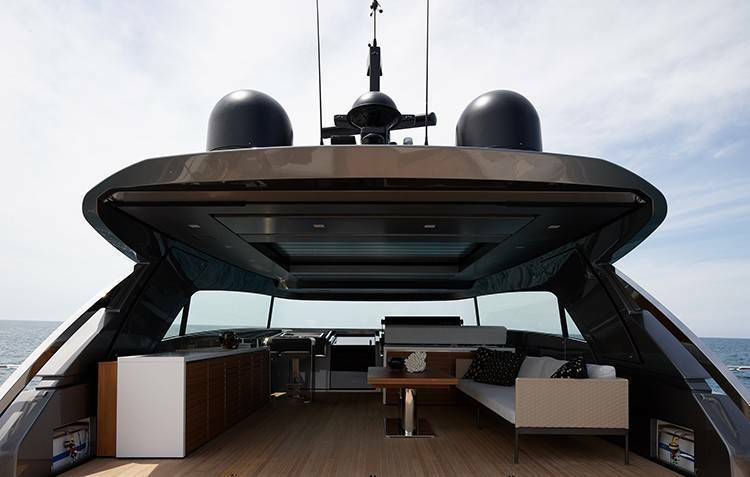 Two stairways connect up to the main deck aft, where guests will find a raised alfresco dining table and movable chairs for casual meals and relaxation. 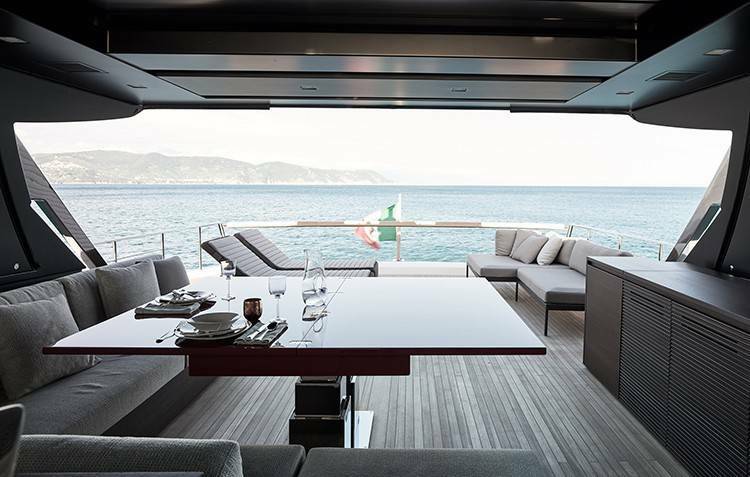 The bow is furnished with a C-shaped sofa and drinks table in front of the raised pilothouse and a sunbed covers the bow. 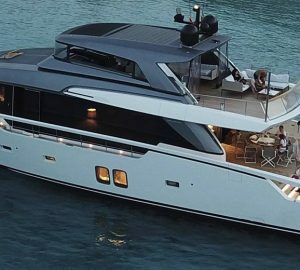 Above, the semi-enclosed flybridge places the helm station forward, behind which there is a wet bar and convertible table with movable chairs. 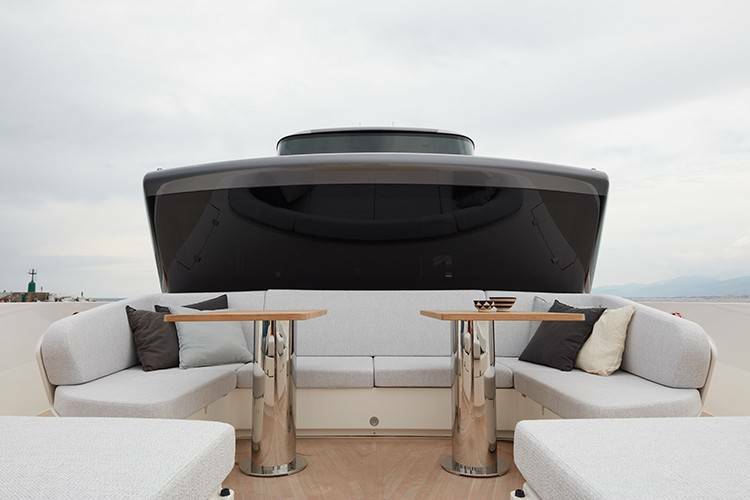 The retractable bimini roof opens the area up to the sunshine, while to the stern there is another seating area comprised of a pair of chaise sofas and a drinks table. The lower deck places the engine room and crew accommodation to the aft, with the guest accommodation taking up the layout from amidships to the bow. 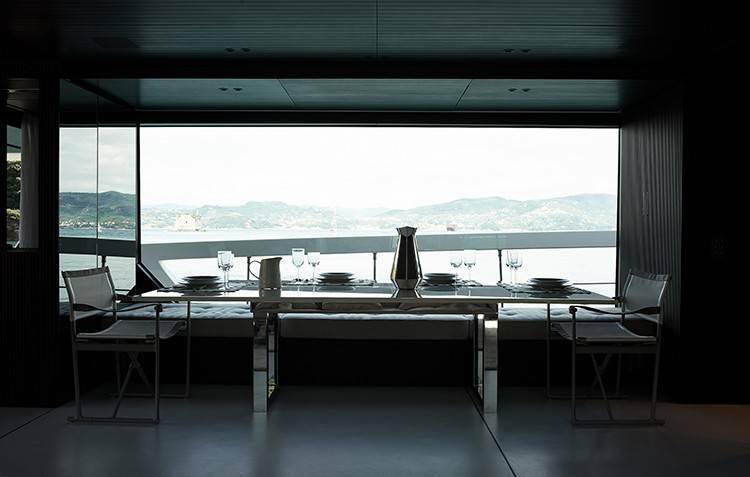 On the main deck, the formal dining area is placed forward and seats the whole group at an elegant table surrounded by windows. The galley is placed behind and to starboard for efficient service, and through the corridor to the aft salon there is a grand wet bar along the forward wall while a daybed/sofa is placed beneath the port windows for casual dining and to starboard there is a deep sofa with a coffee table for casual relaxation while enjoying the views through the expansive windows. Three Volvo D13-800 HP engines produce a top speed of 23 knots and a cruising speed of 11 knots. The accommodation sleeps a maximum of 9 guests across 4 en-suite cabins: 1 Master suite, 1 VIP stateroom, 1 double cabin and 1 twin cabin with 1 Pullman berth. 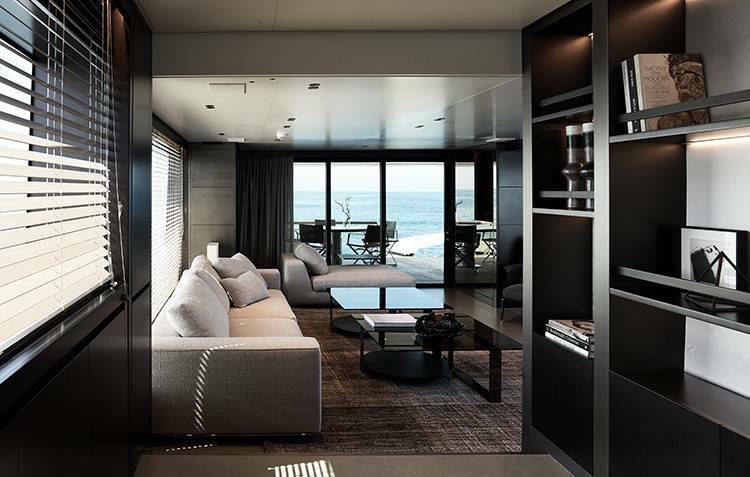 The Master suite is placed aft of amidships on the lower deck to take advantage of the full beam. The bedroom is furnished with a desk, a widescreen TV mounted on the forward wall, a walk-in wardrobe and a bathroom with shower and double sinks. 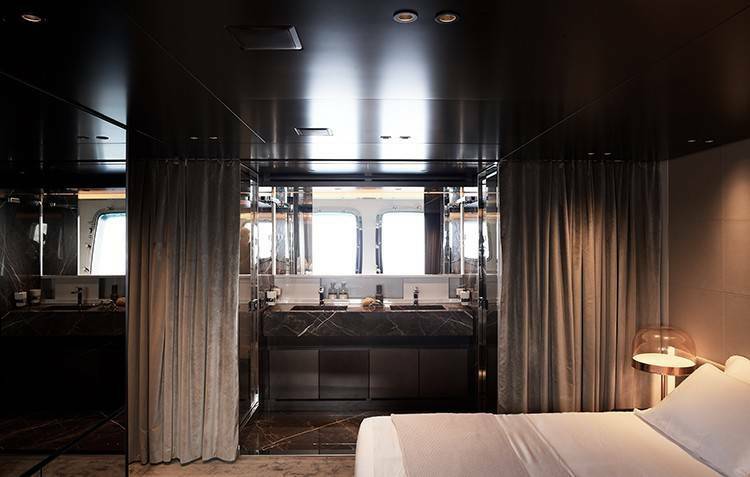 The VIP stateroom is placed in the bow and has the benefit of a day bed beneath the window in addition to a widescreen TV opposite the bed and a large en-suite bathroom. The double cabin and twin cabin are located to port and starboard respectively between the two larger cabins, and there is also a widescreen TV opposite the bed and a beautifully finished forward bathroom.